...the most important health discovery ever? For decades, new-age gurus have referred in a vaguely hopeful way to ï¿½the healing power of the Earth.ï¿½ Now, a former electronics expert has found scientific proof that the Earth can indeed heal usï¿½in a very basic and literal way. He has taken a remarkable journey that began with a bad tooth and just might end in a radical new way for the World to think, live and deal with chronic pain, disease and inflammation. His name is Clint Ober. Clint grew up living a simple farming life in Montana until reaching maturity, when he headed to the city to make his fortune. His career began as a cable TV installer and he rose through the ranks quickly as the industry grew. By the time he reached 49, he had achieved many successes and was living the dream with a huge house and all of the requisite toys. But then a severely abscessed tooth began to shut down his liver, and changed his life forever. Luckily, experimental surgery was able to save his lifeï¿½but the experience changed him forever. Wanting to shed his obsession with possessions, he sold all of his belongings, purchased an RV and began his 4 year odyssey touring the country, eventually finding himself in Sedona, AZ--the birthplace of Earthing. One day in 1998, while sitting on a bench watching tourists walk through Sedona, Clintï¿½s professional background and current situation clicked together to give him an ï¿½Ah-Haï¿½ moment. He began to notice that all of the pedestrians, in their various forms of footwear, were not really in contact with the Earth. They were wearing synthetic soled shoes made of rubber or plastic products and they were not walking on the Earthï¿½they were either on asphalt or concrete and re-bar. Based on his long career and knowledge of electricity, he remembered that all electrical appliances and cable systems had to be grounded to the Earth to stop interference from outside electromagnetic fields, hence these people were all insulated from direct contact with the Earth, keeping them from experiencing the grounding effects of Mother Nature . Could wearing synthetic soled shoes adversely affect our health? The search had begun. Using a simple voltmeter, Clint measured the electromagnetic field (EMF) around his body near various appliances before and after ï¿½groundingï¿½ himself, by connecting his body to a metal wire leading to a grounding rod outside, planted in the Earth. Before he knew it, he had fallen asleep while grounded and awoke refreshed the next morning for the first time in years, having slept through the night without having to take his usual medication for chronic back pain. Amazed, he recruited several friends to join in on the experiment and the results were consistentï¿½better sleep, less pain and a heightened sense of well-being. Thus began the Earthing Movement. The word traveled fast, as many people began seeking Clint out for help. Working with specialty companies, he developed cotton sheets with conductive silver strands woven into them. He also developed grounding mats, car seats and patches to help people connect to the Earth. People with chronic pain, severe inflammation, immune disorders, insomnia and even conditions as disabling as MS were being helped. Within a short period of timeï¿½sometimes as quickly as overnightï¿½people were reporting relief simply by being reconnected to the Earth. Over time, the repeated positive results convinced Ober that contact with the Earth restores a natural electrical state in the bodyï¿½your body slowly becomes infused with the Earthï¿½s omnipresent and ever-present healing energy. 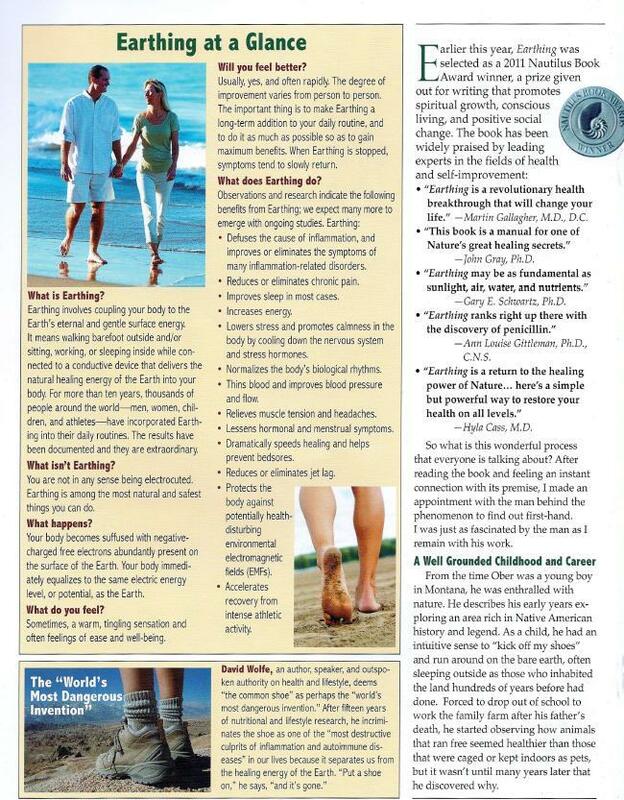 This is what Earthing is all aboutï¿½a simple, safe and natural shift in the body that reduces pain, inflammation and stress. It has the potential to help people with disabling conditions regain a better level of health. In short, people become connected with the planetï¿½s abundant, yet overlooked healing properties. Overcoming Skeptics As Ober was neither a scientist nor a doctor, initially researchers wanted nothing to do with him. He was actually laughed at and his proposal was ridiculed. One doctor told him that even if the idea was valid, he wasnï¿½t about to tell his patients to take off their shoes and get well ï¿½for free.ï¿½ But, finally some members of the health community started to listen and conduct their own experiments using Oberï¿½s techniques. And slowly, they started to agree. 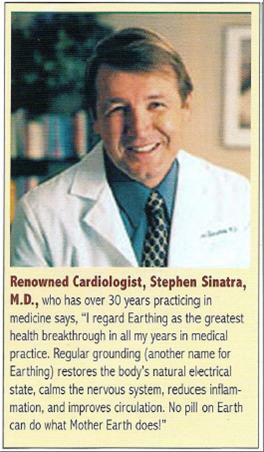 In 2001, Oberï¿½s work attracted the attention of Dr. Steve Sinatra, an integrative cardiologist who believes in combining conventional and alternative treatment for his cardiac patients. 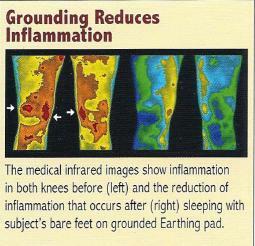 Because the heart is ï¿½one of the primary electrical entities in the body,ï¿½ he felt that if grounding reduced inflammation, it might represent a ï¿½new weapon against heart disease.ï¿½ Using thermography they were able to prove that, yes, Earthing appeared to significantly reduce inflammation, the cause of many of todayï¿½s most serious medical problems. See inserts below. Clint Ober and his colleagues found that the Earth acts as a giant anti-inflammatory agent. The electrical energy on the surface of the planet takes the form of a free and limitless supply of sub-atomic particles called electrons. These electrons are negatively changed, so that when you have direct contact with the Earth, they are absorbed into the body and negate any positively charged areas of inflammation. In essence, they are the key to quenching the free radicals that we all have in our bodies, which are the cause of inflammation. So, when you have grounded yourself, you are reducing the electron deficiency resulting from a lack of grounding and healing occurs because the ï¿½inflammation, sickness and pain in your body are but a manifestationï¿½in large part or smallï¿½of an electron deficiency. The reproductions below represent darkfield microscope images of blood taken from three individuals in attendance at Dr. Sinatraï¿½s house just before and after 40 minutes of grounding. The before image is on the left, the after on the right. 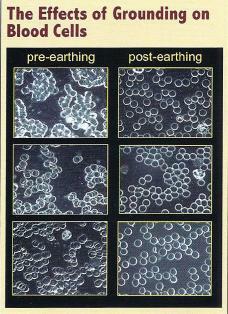 The pictures clearly show a dramatic thinning and decoupling of blood cells. Chronic inflammation comes in various forms, can be very severe and can include: MS, arthritis, fibromyalgia, intestinal disorders, headaches, kidney failure, chronic pain, diabetes, cancer, allergies, cardiovascular disease and more. What could be a more simple and natural way of combating the pain and dysfunction it causes? You can connect to the Earth in very simple ways and as easily as walking barefoot on the ground, swimming in the ocean, sleeping on an Earthing pad or putting an Earthing mat beneath your feet while working on the computer or in your car while driving. The healing potential is amazing, yet simple. While sounding strange at first, after thinking about it for awhile, I am sure that you will agree that nothing makes more sense. The Earth has been found to contain an endless supply of electrons in unimaginable quantities. When the body is experiencing dis-ease or disharmony it is in a positively charged state. If you put your positively charged body next to the negatively charged Earth, the smaller body (you) will pull electrons from the larger body (Earth). Then the electrical potential of the two will harmonize and equalize, which is what Earthing accomplishes. ï¿½Electrons are the smallest possible negative charges of electricity. It is well established that negative charges (electrons) are attracted to the positive charges (free radicals) that are found in all of us. Connecting the body to the Earth automatically enables the conductive tissues of the bodyï¿½s living matrix to become charged with the Earthï¿½s free electrons.ï¿½ The result is reduced inflammation and hence healing! We have been led into a false sense of health security. We were promised that in the years ahead there would be a pill for all our ills and medical insurance for everyone. Clearly, that has not happened. Meanwhile, we have become increasingly disconnected from nature by our modern lifestyle. Not only do we eat unhealthy and un natural food, bur our environment has become equally unhealthy. The old conductive leather-soled shoes of our ancestors have been replaced with insulated plastic. Our homes and offices surround us with electronic devices, wireless connections, microwaves and cell towers, which assail us with multiple forms of interference that act like electricity running wildly through our ungrounded bodies. From the latter half of the 20th century on, everything in our homes, schools and offices have decreased our ability to directly connect with the healing power of the Earth while bombarding us with multiple sources of contamination. Now is the time to reclaim our birthright. Walk proud, walk tall and wall on Mother Earth! 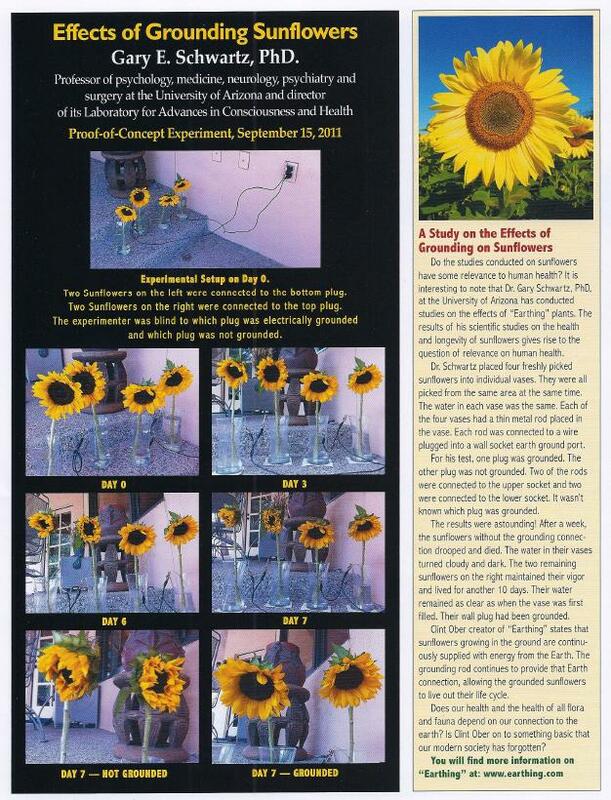 Credits for the above article are given to Going Organic Guide, Palm Springs & the Coachella Valley, Winter 2012, and Grace Xanthos, M.A.,D.C. H.